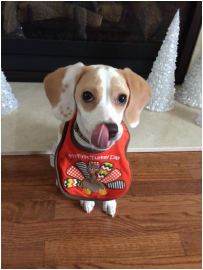 See why so many choose us for their Perfect Pocket Beagle! Best Buddies We brought Mia home when Samson was well over a year old. He had only ever been around other dogs in our household so we watched him very closely when we brought the new kitten home. However, there was nothing to worry about! He took an immediate liking to Mia and they became fast friends. They wrestle and chase each other around and then take a nap when they get tired. I can't say that I am surprised though. Samson has been so sweet and friendly since the day we brought him home. So, if anyone has any questions about how pocket beagles might act around cats here is a cute pic of my little cuddle bugs. This is Rosie!! She is three pounds in this picture at three months old. She is sitting in my lap as I write this being so cuddly and sweet! She has brought so much love into our lives and now we can't imagine what life would be like without our Rosie! She has the sweetest little face and loves to snuggle and cuddle with anyone who will hold her. She has a big sister, Lucy, who is a 25 pound puggle, and an even bigger brother, Clancy, who is an 85 pound chocolate labrador!! She gets along with both of them and they love having their little baby sister to take care of. Jan was so amazing to work with, she was so helpful during the purchasing process and still is available to call about any questions that we have about Rosie. We recently acquired "Sam" from Jan. We have been working with Jan for several months. We told her we were leaning towards a "lemon pocket beagle." Upon the next litter, she immediately sent us a picture of the "perfect lemon pocket beagle." After we decided on Sam, Jan continuously updated us with pictures and videos of Sam's progress. From start to finish, the experience of buying a "perfect pocket beagle" from Jan was great. The most positive part of the experience was that Jan would take the time to personally answer your questions. Before you buy a puppy from any one else, please call Jan. Jan's Pocket Beagles are registered with the Olde English Pocket Beagle Registry, also a big point for us. Call Jan first! Toby has become a special member of our family in just a few short months. After a long search for a family dog, we discovered the Pocket Beagle and were fortunate to find Jan Walker. We live in Connecticut, so it was a leap of faith to purchase a puppy without ever meeting him ahead of time. Jan kept us so well updated and was always so accessible, that it didn't feel like Toby was all the way in Oklahoma. She took great care in making his journey as stress free as possible. He arrived healthy and settled in with us quickly. He attracts attention wherever we go, because he is just the cutest, sweetest little guy. Everyone asks questions about him and of course wants to pet him! Toby will roll on his back and take a tummy rub from anyone. He's truly a "Perfect Pocket Beagle!" Thank you, Jan! After 4 years of asking for a indoor dog I finally got a "yes" but it could only be another beagle, a boy, and purebred. I instantly went on line and googled beagle puppies for sale. I found Jan's website and clicked on the pictures and immediately fell in love. I waited a few days and called her. Our first conversation was like we knew each other for years. She immediately sent me pics of what she had available, and I sent her a deposit the same day. She told me I could call anytime to check on my puppy, and she sent me pictures of him weekly. I couldnt wait to get him but she was very worried about his flight. Together, we found a direct flight and I was willing to drive a distance to get him. She kept in touch the day with me until I finally got him. He came in his own crate that she supplied and had it all decorated with one of his own toys. He had a bag of food and all his paper work was secure underneath his homemade bedding. Jan is a very caring person that truly cares about her animals and where they go. We still talk and i send her pictures of my Oakley. I would recommend her puppies to anyone looking for a small dog for their house. Thanks so much for my puppy, Shannon Barber. We've had Daisy for a week and it was love at first sight. We picked her up at the Santa Fe airport, and it couldn't have been easier. Jan warned us that Daisy might have an upset stomach and might take a while to adjust, but she adjusted almost immediately and has been happy every day. We take her for walks and she couldn't be happier and seems really healthy. It's amazing that even at probably 4 pounds she can keep right up with us. I have to say that Jan is wonderful to work with, to talk to, and she takes wonderful care of her puppies. There's no question that Jan works hard to care for her puppies and gets them ready for their new family - we couldn't be happier. Hi my name is Marietta. We reside in Long Island NY decided back in July to add another addition to our family. After so much researching I came across Jan Walker spoke with her a couple of times and I knew the minute after I hung up with the first phone call she was the one we were going to get our little boy from. She immediately sent me pictures of the puppies she had available and the decision was quite easy for us. Once a week she would send us videos, pictures and I would randomly call her for updates she was absolutely wonderful to deal with and made this process so much easier. Tango is now 5 months old and he was the best addition to our family 3 kids and 11 year old beagle. From the minute Tango came into our home he got along with our senior dog and the love they have for each other is like no other. So today I want to say thank you so much for putting a smile onto our childrens faces everyday and for making Toby (our other dog) so much happier. I will definitely be using Jan in the future and thank you for everything. Sophie is my perfect Christmas present. And she IS perfect! It is clear that Sophie was loved prior to coming to us. She arrived in a beautiful crate and was calm, despite having flown all the way to Maryland. Jan drove three hours each way to ensure Sophie would have a direct flight to reduce stress on the tiny puppy. Jan included all necessary paperwork and even a bag of food so we could transition Sophie's diet. My vet examined Sophie and declared her to be in excellent health and commended the medical treatment provided by Jan. She also appreciated the documentation provided to us that clearly stated what she had received and advised us to give the form to our vet and always follow the vet instructions. The vet said she's seen breeders spanning the spectrum and that Jan is clearly at the to end of that spectrum. We couldn't agree more! 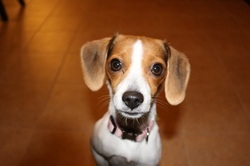 Sophie is a typical beagle in looks and personality, just so perfectly tiny! We love her so much! Thank you, Jan! Lucky Lady Liberty seems to be the happiest Beagle in Europe, she gets to travel, has many friends (human and dogs) and has a special “boy friend”, a greyhound-parson terrier mixture, 4 months old. The two play from morning till night and when he left this morning to go back to Germany, Lucky cried for half an hour. She also cried when our son’s beagle Luna left after a week with us! LLL is very social, friendly to all children and dogs and seems to enjoy every doggy visit and human guest! We repeatedly have been to doggy school and Lucky Lady Liberty is doing quite well for a beagle! Thinking fondly of all of you over there and I am sure LLL sends you lots of kisses! Last year for Christmas I got one of Jan's perfect pocket beagles as a gift and let me say it was just that PERFECT! I named the lil girl Tiny because that's what she was, and still is! Tiny was so well taken care of and SO loving and playful you could just tell she came from a great place! I have had her almost a year and she has brought so much joy to myself and my whole family I would definitely suggest owning one. They will be your best friend the minute you meet them!